Special Note: Do not use alkaline soap cleanser or soap to wash your face, use a neutral or slightly acidic, or will shadow effect of the composite growth factor. [Product efficacy] variety of biological factors IL, MT, SCF, EGF, etc. made Ã¢â‚¬â€¹Ã¢â‚¬â€¹by the latest bio-technology composite made by a certain percentage of recombinant skin repair system, which SCF direct effect on stem cells, specificity, efficiency, transfer promoter in a "sleep" state of the stem cells, to promote stem cells rapidly proliferate and split into the large transient cell proliferation, maintaining the cells in "activated" state; EGF induce transient proliferation lot converted to a mature epidermal cells, skin cells in a Quick update status; MT powerful free radical scavenging, provide a good external environment for the SCF, EGF's role, while, because of its efficacy has a strong pigmentation in the skin to get rid of aspects which make up the SCF, EGF in this regard insufficient to overcome the limitations and side effects of traditional single factor, so that the cycle of skin cells metabolism and achieve the best balance, fast, safe, and effective repair damaged skin. Rapid freeze-drying technology enables a variety of active factors to maintain its activity, providing its absorption and utilization, use of 7 days beginning markedly, use half the skin significantly improved, using January effect is obvious, for a variety of damaged skin repair. Long-term use, will make your skin always maintain health and vitality. After the dissolution of soluble enzyme solution with use. 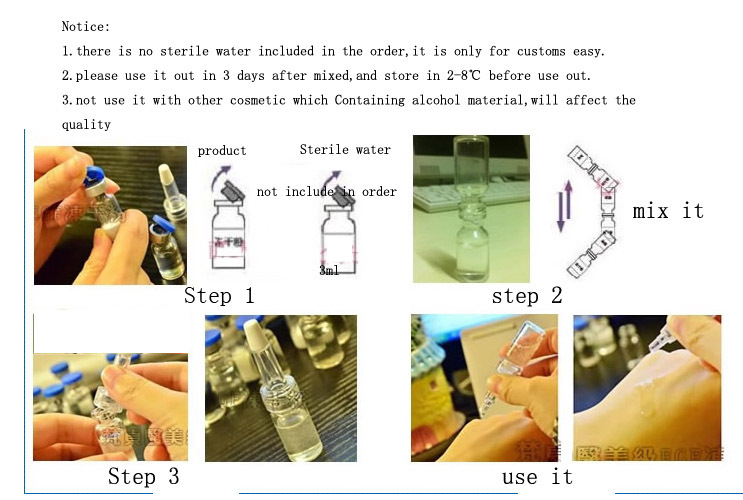 Usage: inject 3ml sterile water to lyophilized powder bottle, then gently shake the can. Apply need place. 5-7 days after mixed. Placed in the refrigerator (2-8 degrees C) activity can be stored 10 days (because of high activity, high concentrations, better use out in 3days ). 1, peels, dermabrasion, laser skin treatment, IPL, medical cosmetic surgery needed to repair damaged skin. 5, after the acne treatment wound repair and maintenance. 1, please do not use it with other chemical classes beauty products. 2, peels, dermabrasion, laser skin treatment, IPL, medical cosmetic surgery use,please clean the wound with saline(sterile water) before use. 3, the product is suitable for all skin types. Can be used for long-term allergic skin repair and maintenance.